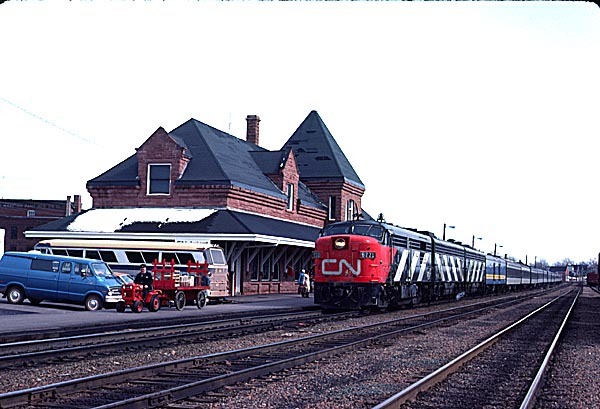 All stations shown with passenger service in the CN employee timetable of April 28th, 1974 are listed together with a few others. Photos are added as they become available, so come back soon. Index of heritage locations for which photos are included: Amherst, Annapolis Royal, Antigonish, Argyle Armdale, Bear River, Bedford, Belmont, Berwick, Bridgetown, Bridgewater, Brookfield, Brown Point, Christmas Island, Clarksville, Clementsport, Church Point, Cornwallis, Dartmouth, Digby, Elmsdale, Ferrona Junction, French Village, Glengarry, Grand Narrows, Grand Pre, Granville Ferry, Halifax, Hantsport, Havre Boucher, Hubbards, Ingramport, Iona, Joggins, Kennetcook, Kentville, Kinsac, Lawrencetown, Liverpool, Lockeport, Londonderry, Louisburg, Louisdale, Maccan, Merigomish, Meteghan, Malagash, Middleton, Milford, Monastery, Mulgrave, Musquodoboit Harbour, New Germany, New Glasgow, New Glasgow-Stellarton, Nictaux, North Sydney, Orangedale, Oxford Junction, Parrsboro, Petain Pictou, Port Clyde, Port Hawkesbury, Port Hood, Port Mouton, Pugwash, River Hebert, Shubenacadie, Somerset, South Maitland, Springhill, Springhill Junction, St. Peter's, Stellarton, Stewiacke, Sydney, Sydney Mines, Tatamagouche, Truro(DAR\CP), Truro (CN\VIA), Waterville, Wallace, Wellington, Weymouth, Wilmot, Windsor Junction, Windsor, Wolfville, Yarmouth (DAR), Yarmouth (H&SW). 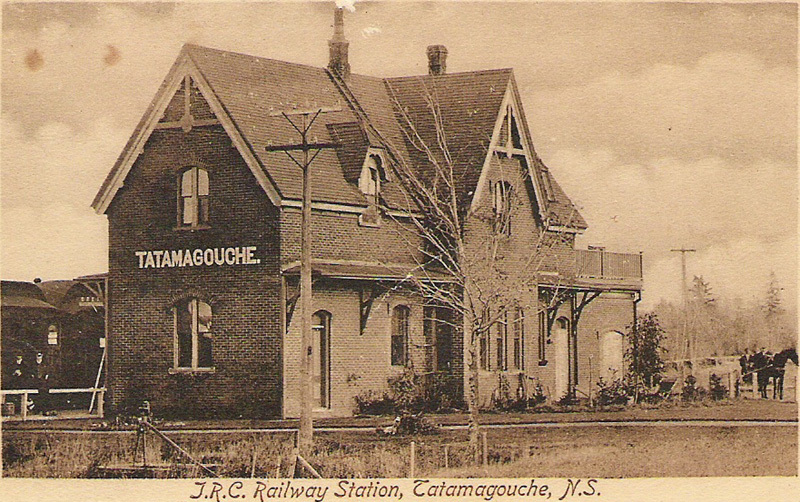 The Canadian National (originally the Intercolonial Railway) main line crossed the Tantramar marshes fom Sackville New Brunswick to Amherst, Nova Scotia. 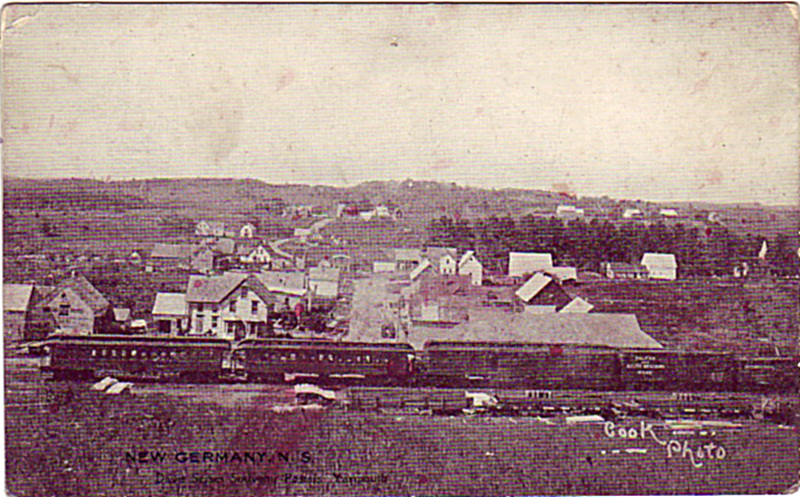 It then passed through Maccan (connection to Joggins Railway), Springhill Junction (connection to Parrsboro), Oxford Junction (connection with Oxford Subdivision to Stellarton and Pugwash), Westchester, Folly Lake, Londonderry, Truro (connection to Hopewell Subdivision and Sydney), Stewiacke, Shubenacadie, Windsor Junction (connection with DAR and Dartmouth subdivision to Upper Musquodoboit) and around the Bedford Basin to Southwestern Junction (connection with Chester Subdivision and Yarmouth) and into Halifax. 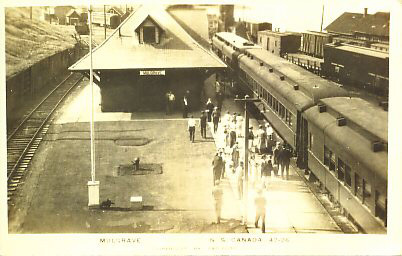 The upper photo shows the station in its Intercolonial Railway days whereas the lower shows it after it was taken over by Canadian National Railways. - Bill Linley photo, � 2003. 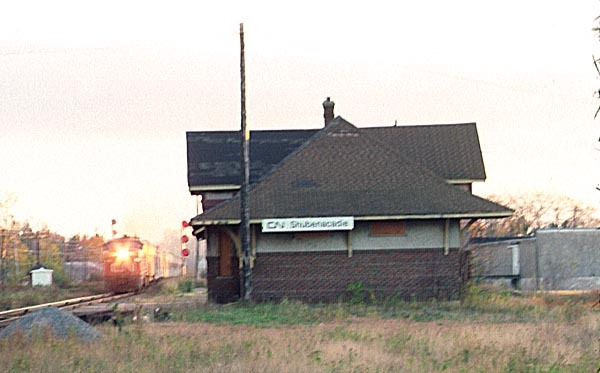 A westbound CN Passenger train headed by FPA4 6771 is entering Amherst. 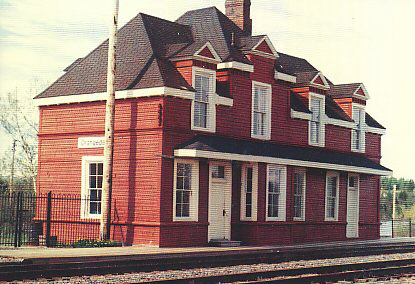 The station is built of red sandstone. 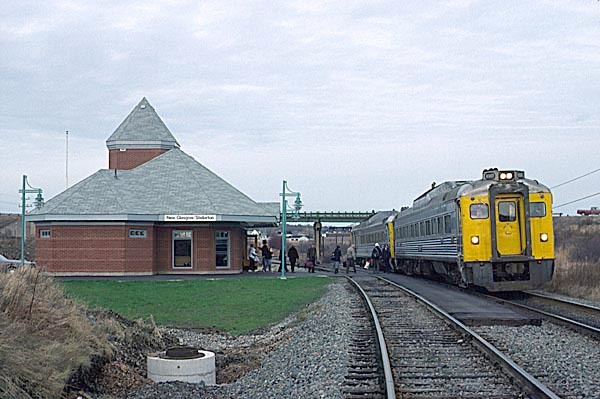 A connecting bus to Prince Edward Island stands beside the station. - David Othen photo, � 2003. 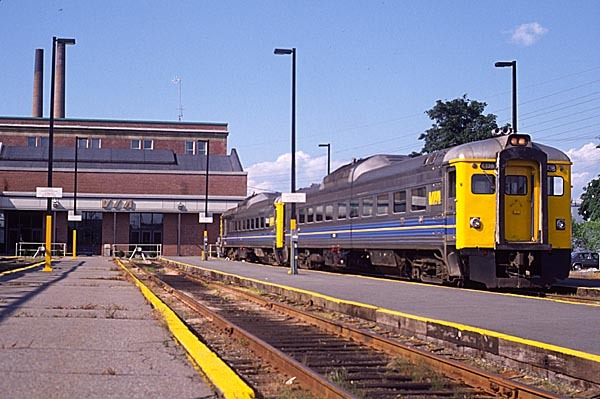 The eastbound VIA "Atlantic" with F40PH-2 6422 and F9B 6618 illustrate the change in 12 years to the trains and the stonework has been cleaned. on 23 February 1980 and 28 February 1980. - David Othen photos, � 2003. 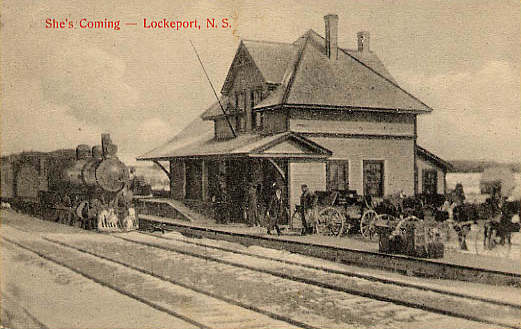 In this photo, the westbound VIA Atlantic has stopped to load baggage beside the brick station. 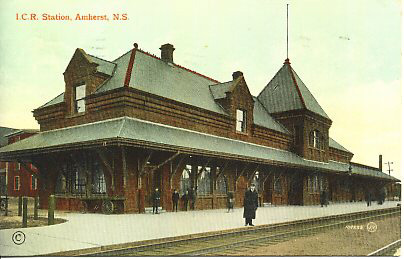 A week later the eastbound Atlantic is stopped at the station. - David Othen photo, � 2004. 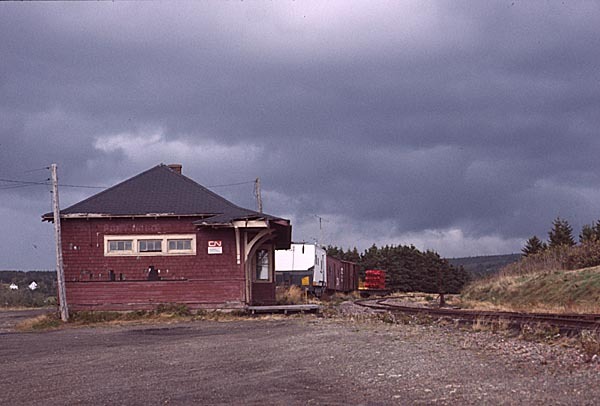 The station has been replaced by a VIA shelter but it too has now gone. and on 5 October 1977. 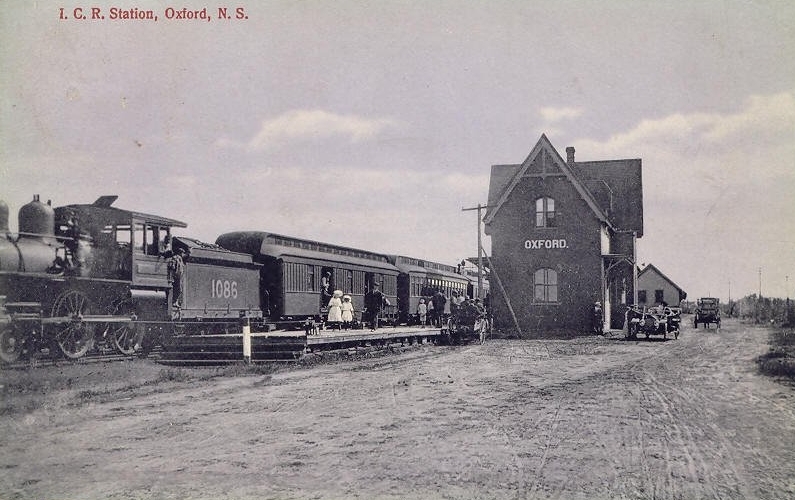 The triangular junction to the Oxford Subdivision runs on both sides of the station. 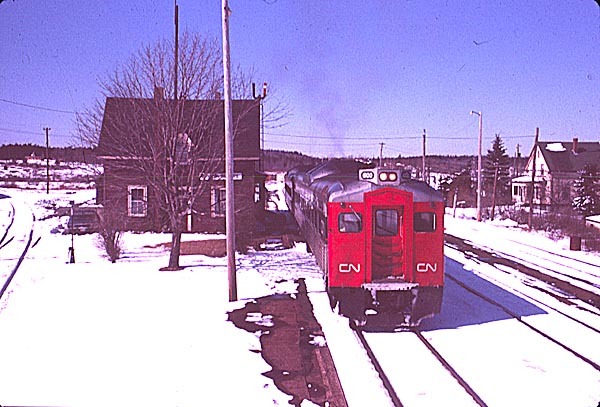 In 1977 trains still ran to the salt mine at Pugwash. 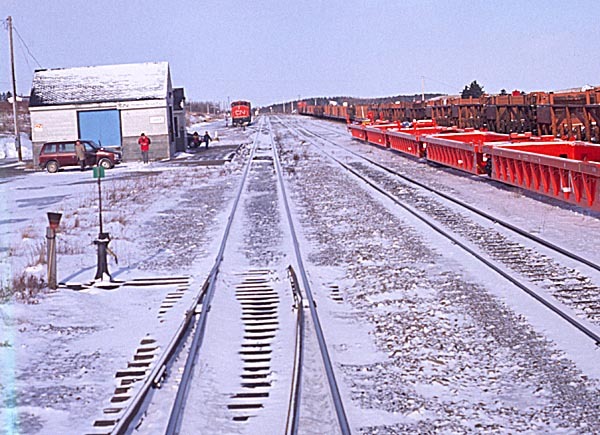 Now the salt is trucked to a loading facility which has been built several hundred yards down the branch, the rest of the track has been lifted. 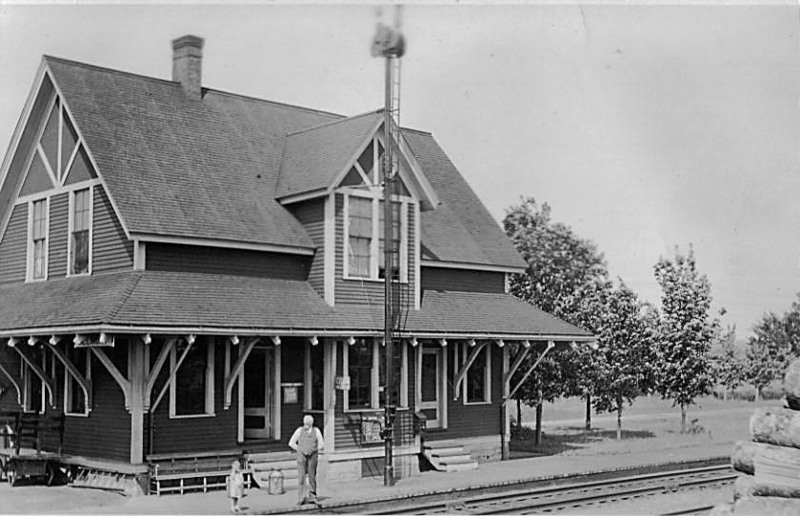 This station was demolished soon after these photographs were taken. - in 1931 - photo from the collection of Doug Fleming. 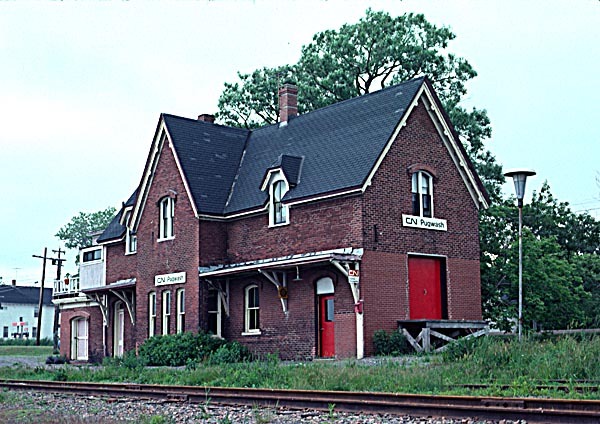 These show the original brick station built by the Intercolonial Railway. 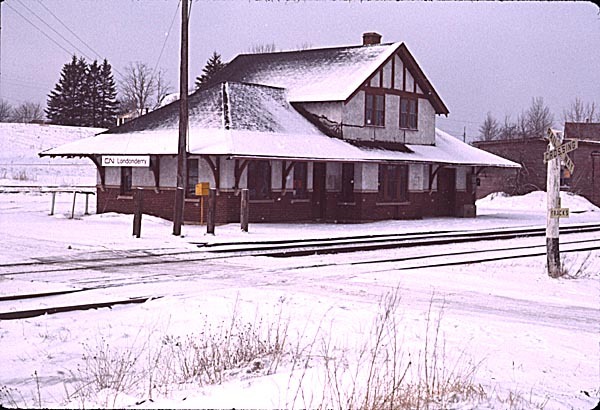 7 January 1990 (lower photo). 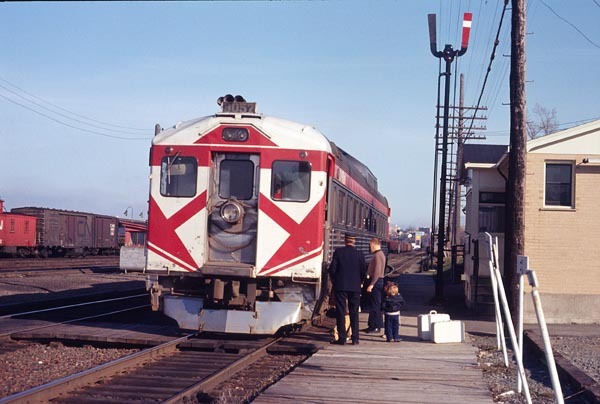 Trains 604 and 605 provided daily service between Halifax and Sydney via Truro but had only another week of operations prior to abandonment. In the lower picture, F40PH-2 6432 & F9B 6616 with the westbound Atlantic (VIA train 11) are waiting for connecting passengers at Truro. 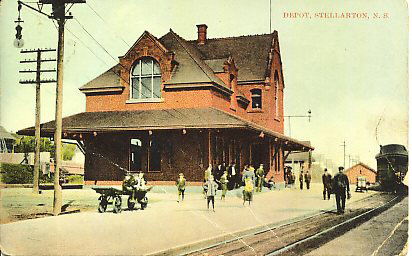 The brick station had been torn down and replaced by a strip mall whose wall is seen on the right. A small ticket office and waiting room in the centre of the mall is still in use today. - Bill Linley photo, � 2004. 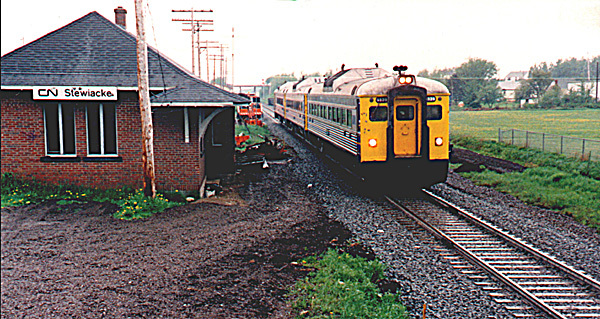 2117 and the oil train are eastbound in August 1992. 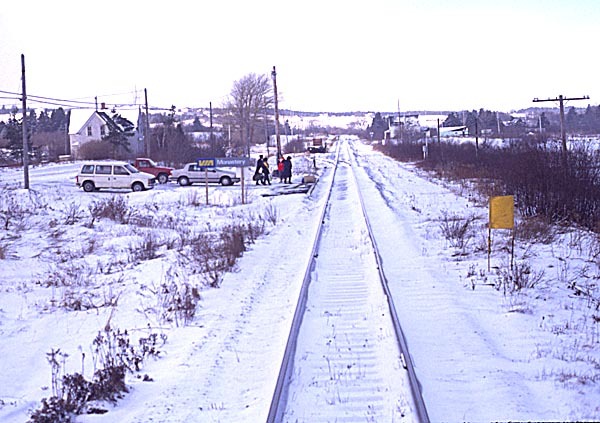 Three VIA RDCs are westbound past Stewiacke station. The Ocean derailment on 12 April 2001 occured close to here. 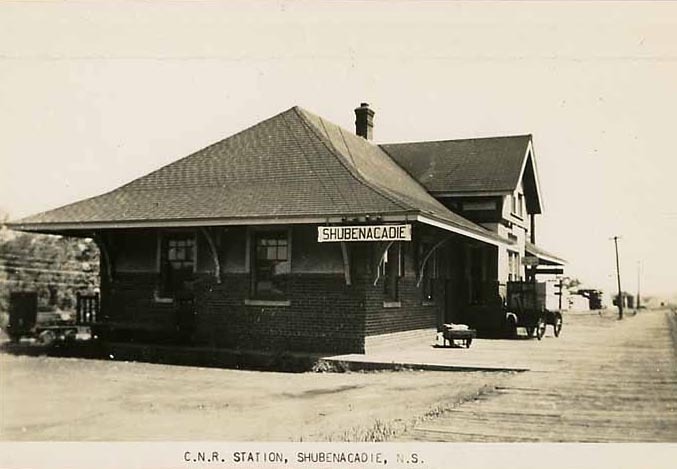 Shubenacadie station at dusk on 19 October 1975. 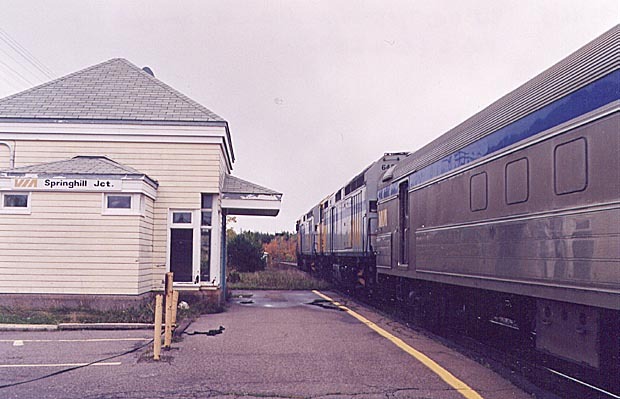 The westbound Scotian is passing the station at about 60 mph. 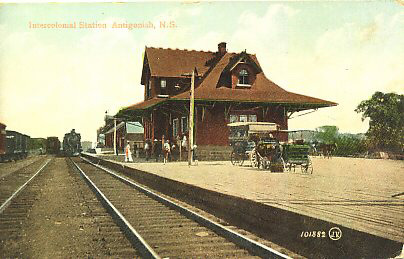 The station has since been demolished. 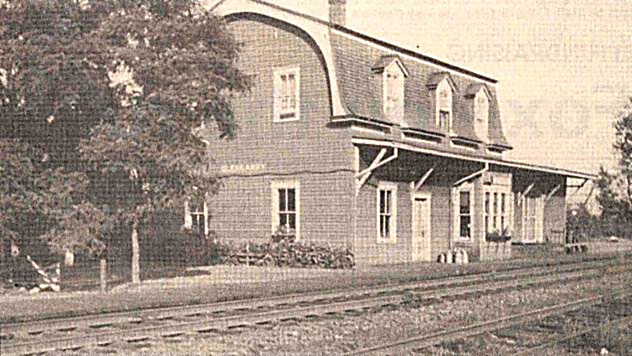 This is the former Milford station. The building is currently vacant while the Municipality of East Hants pursues a new tenant. 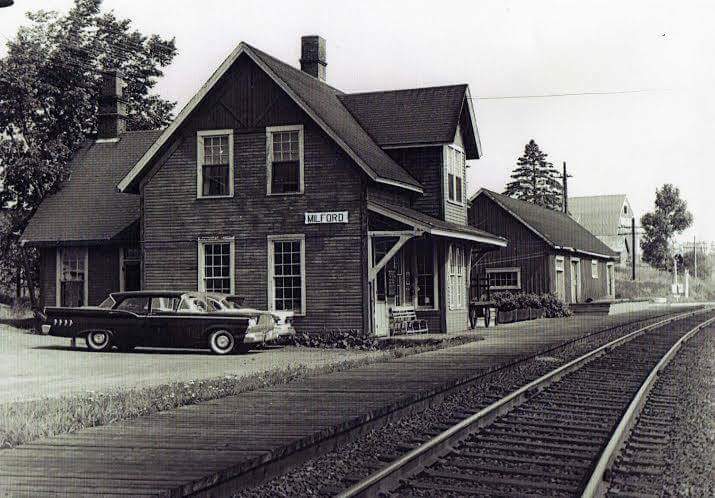 The Nova Scotia Railway Heritage Society would like to operate a railway heritage centre from the site but so far has been unable to raise the necessary funds. - in 1891 - photo from the collection of Doug Fleming. and in December 1978 and October 1986 (bottom three photos). 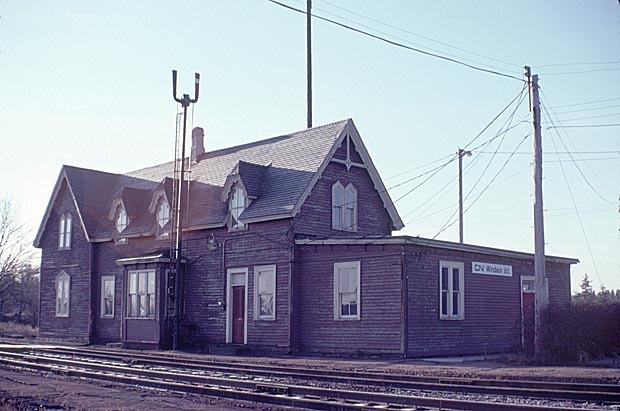 The original building was a two story building with two platforms for the main CN lines and another (to the left in the middle picture) for the DAR line to Windsor and Yarmouth. 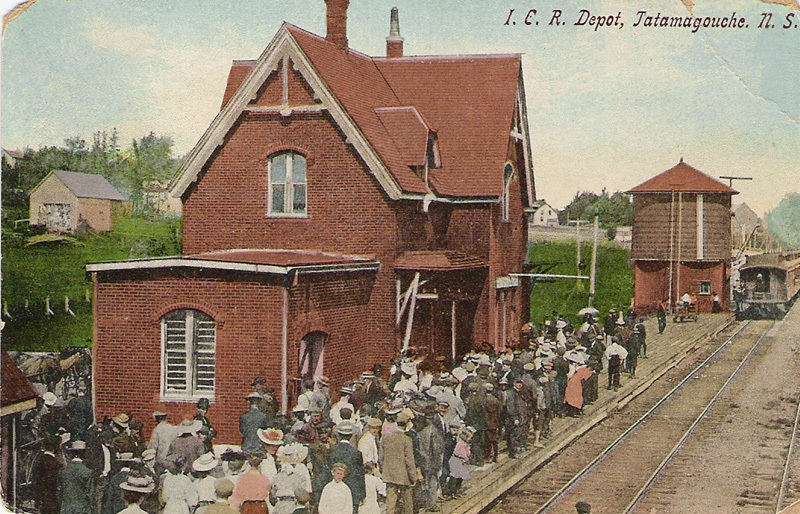 In the top picture CP's Yarmouth bound train is leaving the main line and crossing over to the DAR platform on the left of the station building. In the second photo CN's westbound Scotian headed by FP9A 6521 is slowing to pick up passengers whilst in the third picture two eastbound CN Rail Diesel Cars (RDCs) lead by 6100 are heading towards Halifax. 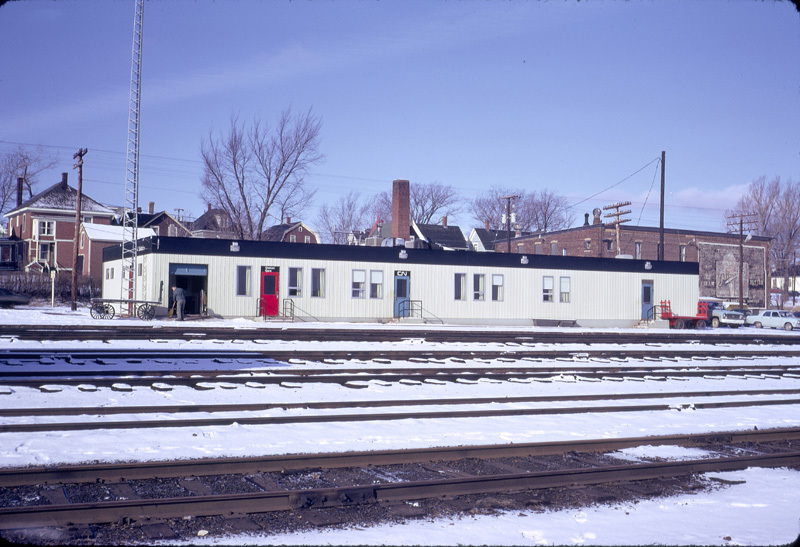 The fourth picture shows an eastbound CP dayliner approaching the station from the DAR line and the fifth picture shows the front of the station in December 1978. 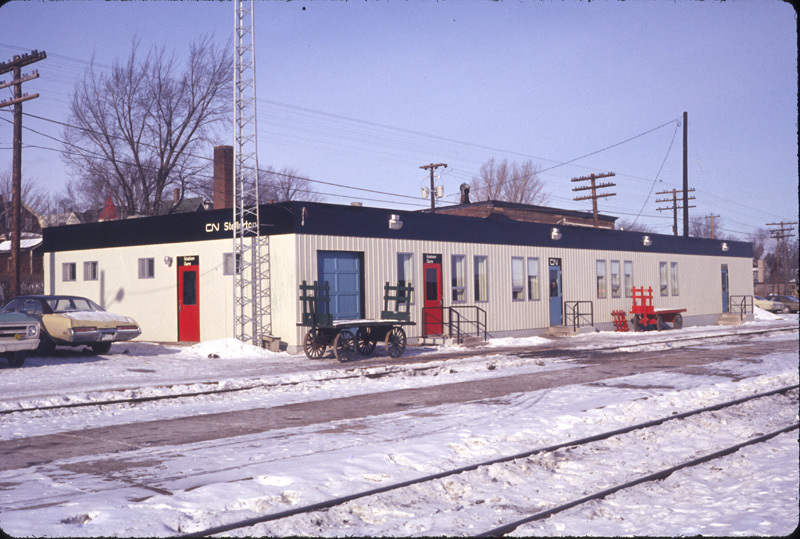 In the late 1970s the station was torn down and replaced by an ATCO portable building. 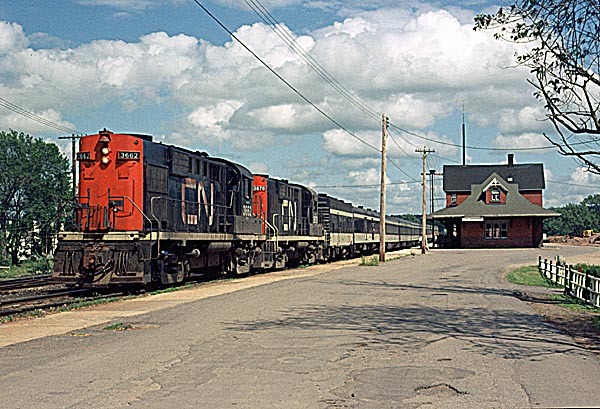 Ex CN RDC 6118 purchased from the Boston & Maine Railroad and now in VIA livery is heading to Halifax (bottom photo). - in 1902 (upper photo) - photo from the collection of Doug Fleming. 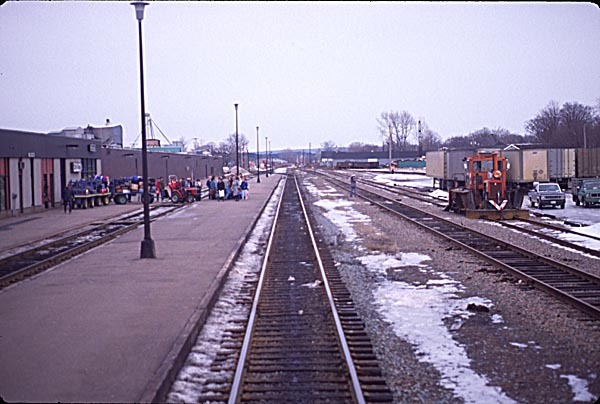 - seen from RDC 6 January 1990 (middle photo). There was still a conventional double track line and so there are platforms on both sides. The right hand platform was built of wood and stretched out over the embankment. 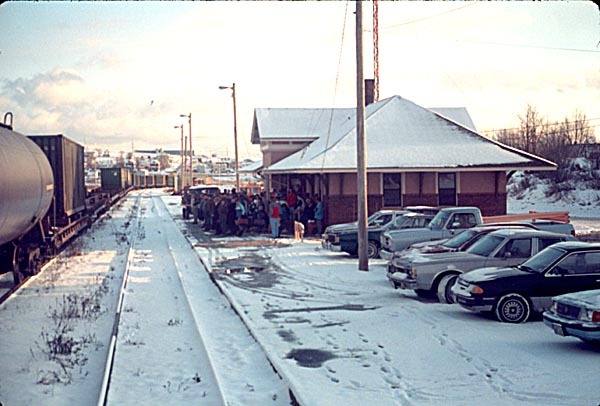 Passengers had to cross the line via the planked walkway in advance of the train's arrival. 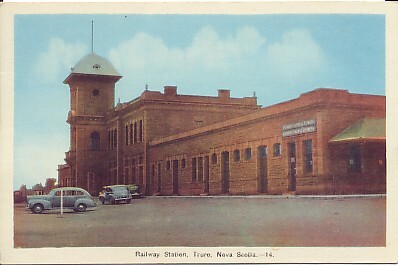 The station has now been demolished and new buildings in the style of an 1850 Intercolonial Railway station and freight shed have been built. This new station is a craft & gift shop. 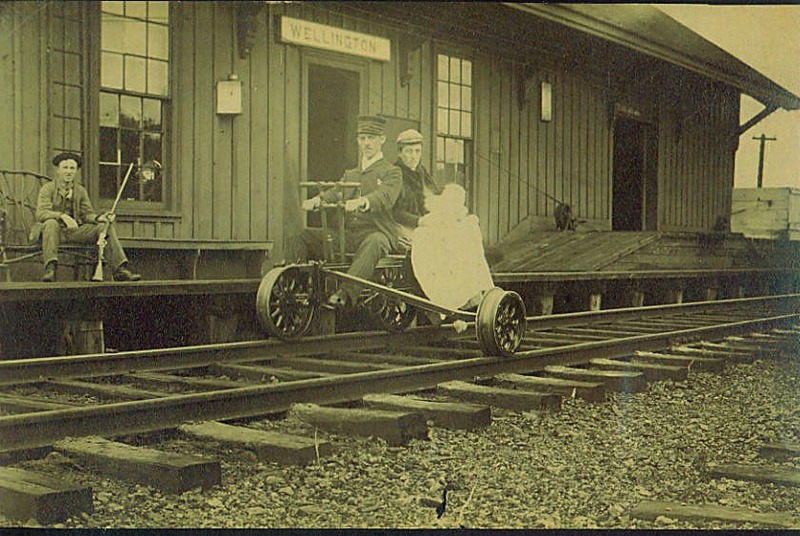 Probably early 1900s - note the countryside surrounding the station! 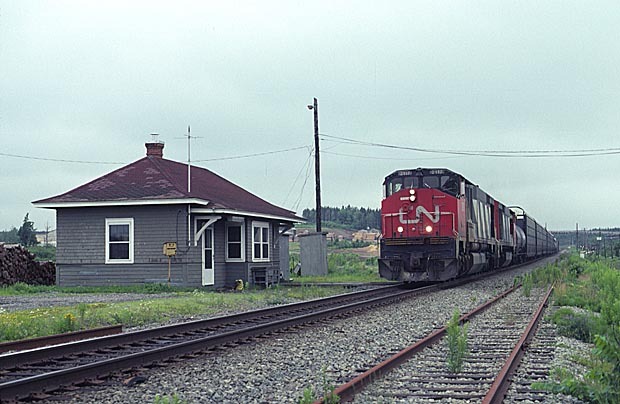 Halifax bound CP 9057 is detraining passengers in June 1975 (upper photo) and the station is seen from train 151 on 15 July 1989. Both CP and CN and later VIA trains called at Rockingham on the outskirts of Halifax until the cuts in 1990. 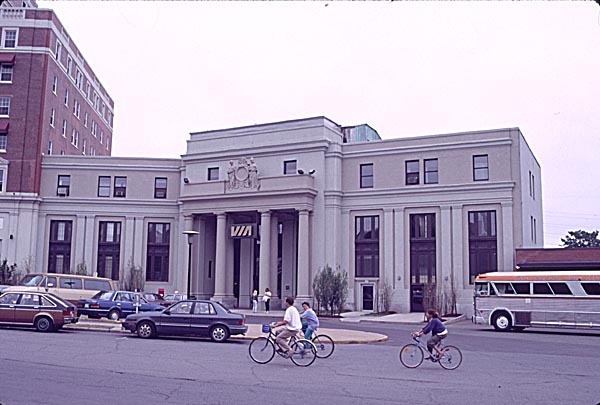 Thirteen years later their re-use as commuter stations is being discussed. In the lower picture taken from VIA RDC 6138 bound for Yarmouth the two wooden platforms can be seen. 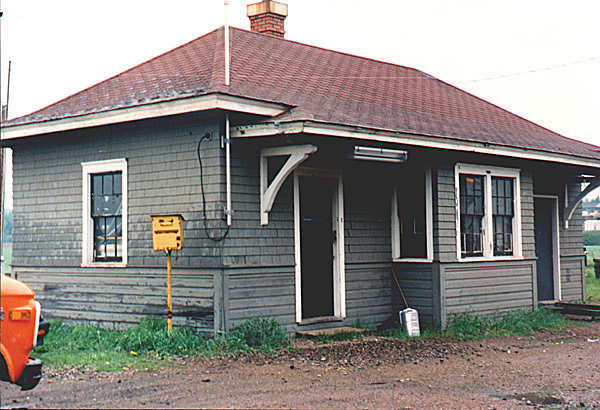 The Rockingham station is now a crew sign-on point and the offices of the Rockingham Yardmaster. 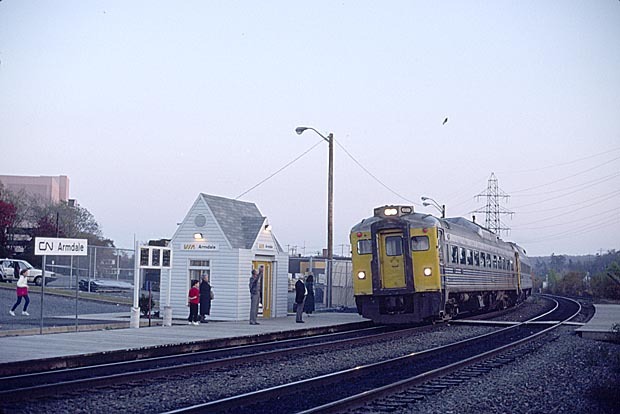 VIA built a gabled shelter at Armdale. 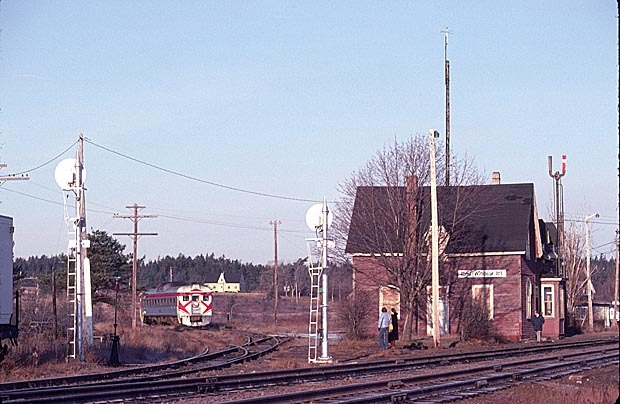 By this time all RDC services but not the Atlantic stopped on signal at Armdale, Rockingham and Bedford. 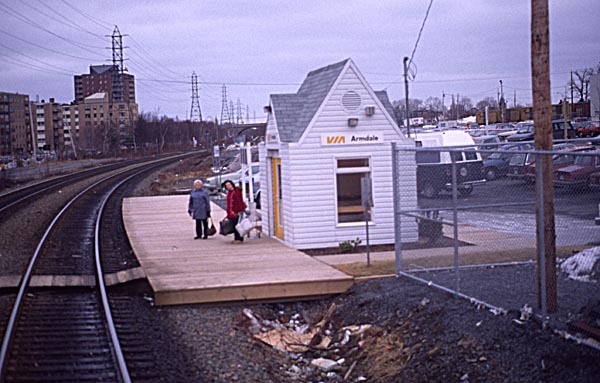 The shelter was removed after the VIA cuts in January 1990 and the track has now been singled. 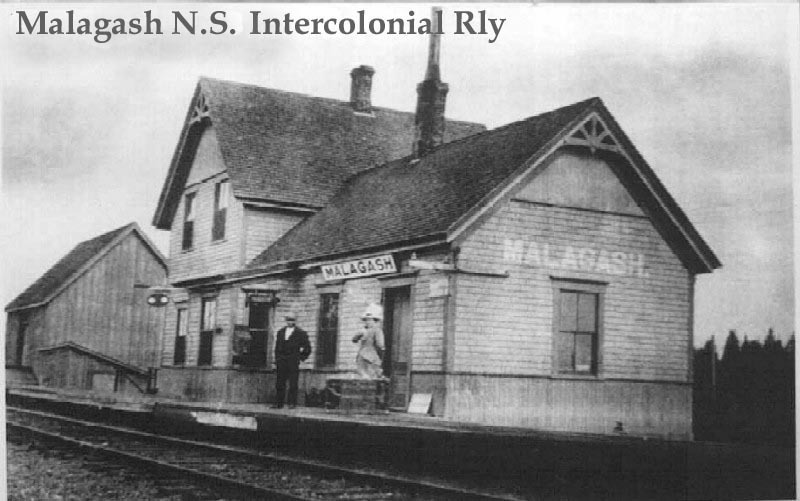 The upper photo shows the ICR station built by Alexander McNab in 1878 at North Street. 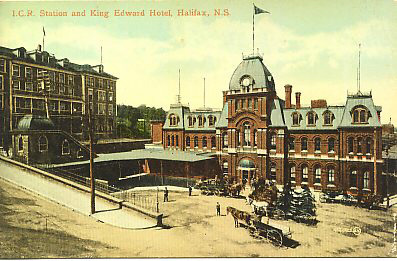 It was heavily damaged in the Halifax Explosion of 1917. 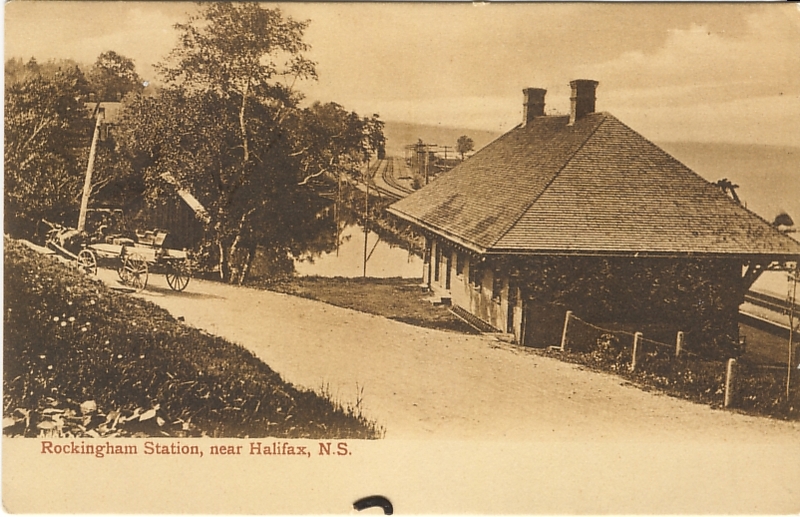 The lower photo shows the current station built in the south end of Halifax by John Scofield in 1922. - David Othen photos , � 2003. 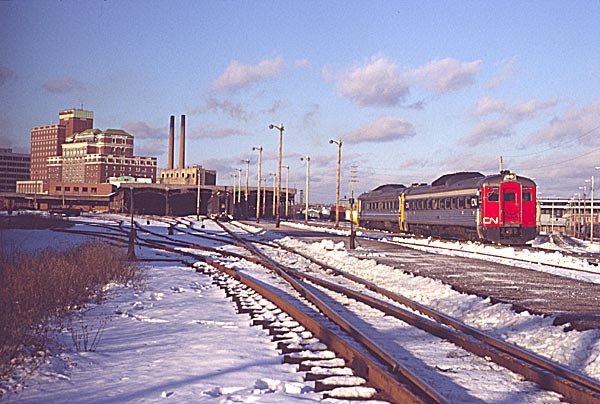 It is 4:00 pm on a bright day in February 1980 and VIA train 601 is leaving Halifax for Sydney with RDCs 6119 in CN livery and 6206 in VIA livery. 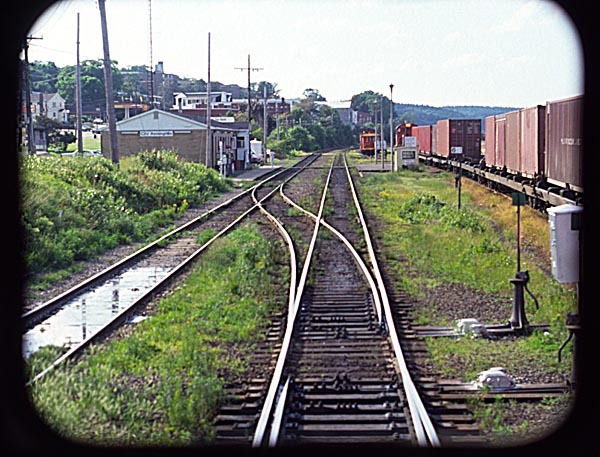 The station still has extensive sidings for less than carload freight and piggyback services to the left - this area is now occupied by Atlantic Superstore. 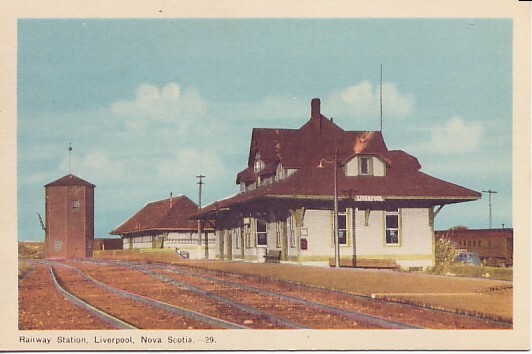 The trainshed is still in place (second picture) and at this time the Hotel Nova Scotian is still a railway hotel. The third picture shows the ornate entrance to the station on 14 July 1988. 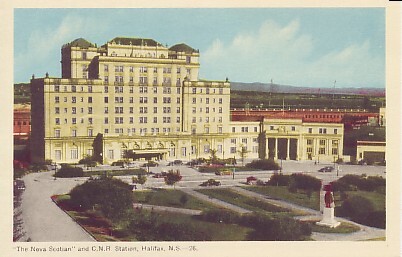 The Hotel Nova Scotian is just visible on the left. By 1989 the train shed had been completely demolished and VIA train 151 stands ready to depart for Yarmouth on 15 July 1989 with RDC 6138 in the lead. 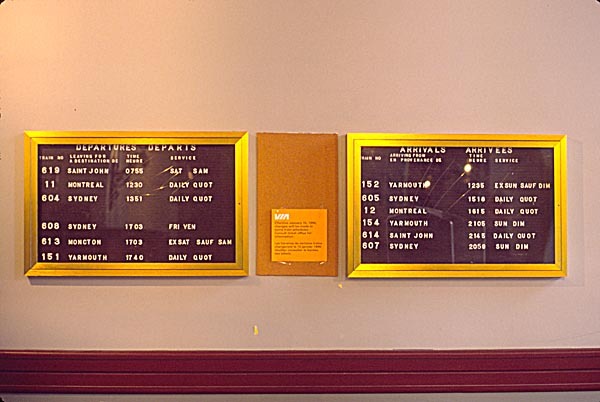 The fifth picture shows the train board on the 6 January 1990 - seven days before the axing of all remaining branchline passenger services in Atlantic Canada. 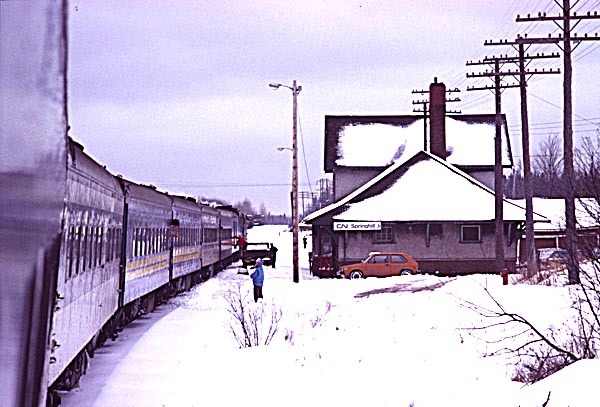 Now there is one train to and one from Montreal six days per week. 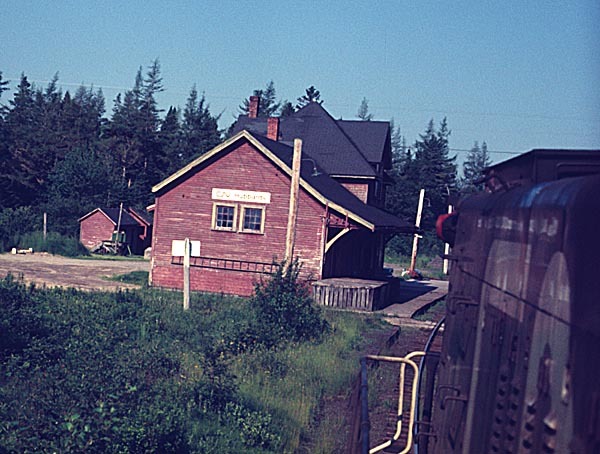 Pugwash station in July 1976. 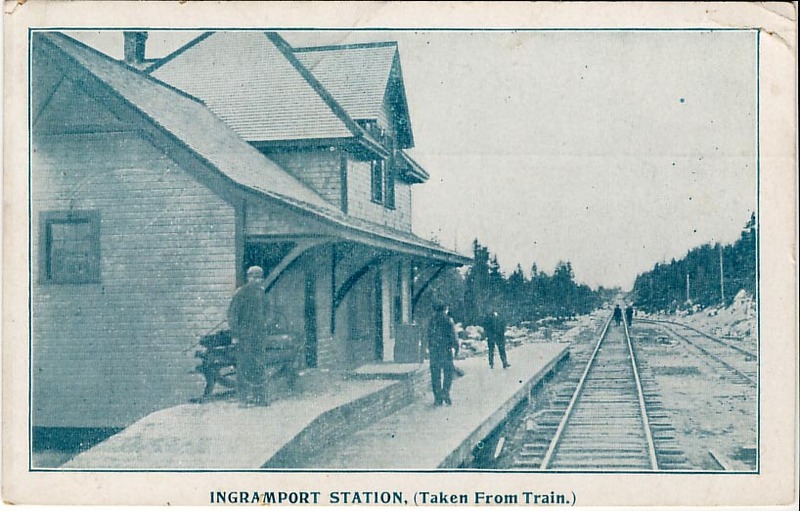 This station was on a short spur to Pugwash harbour. 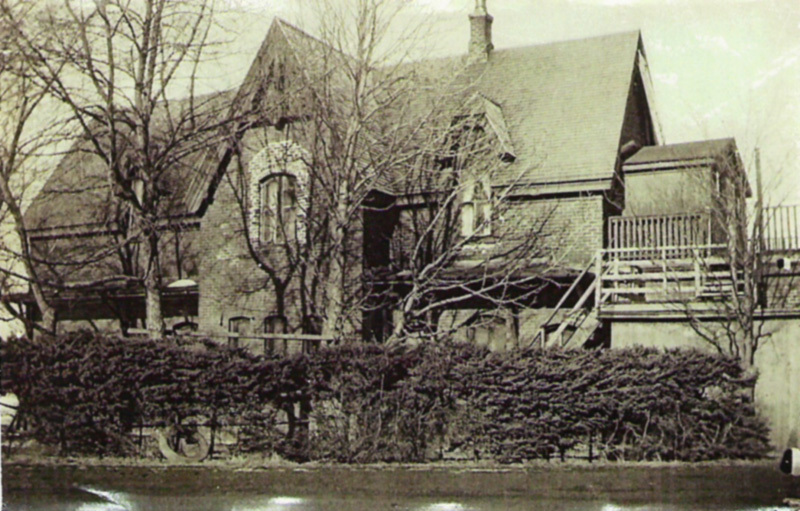 The building is now used as a library and community resource centre (close window to return to this page).. 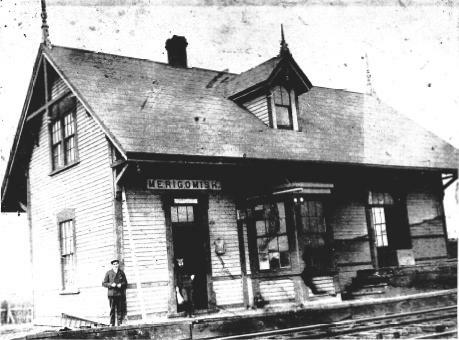 This station was built in 1888 and was torn down about 1970. 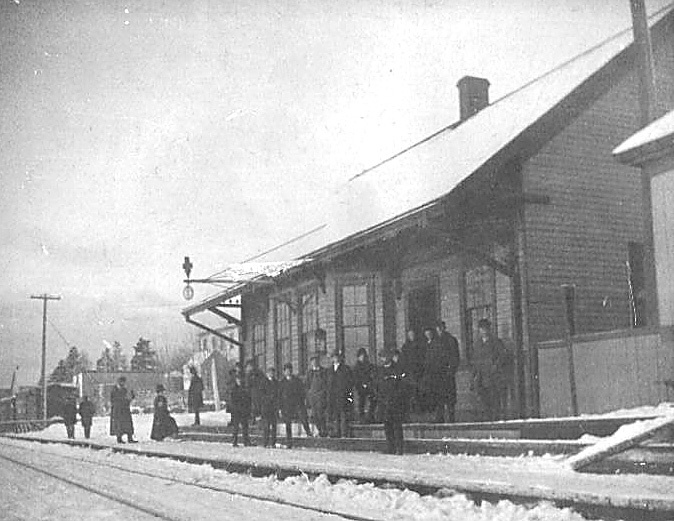 Malagash Station on 12 May 1914. 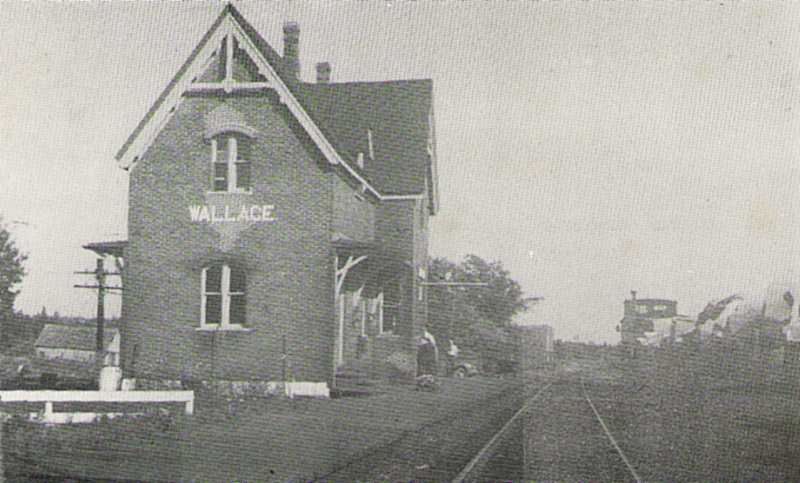 The first picture is a photo showing the station and part of the village (date unknown). 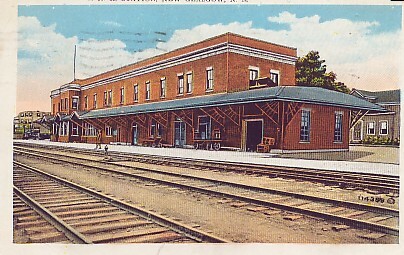 The second is a postcard showing the rear of the station. 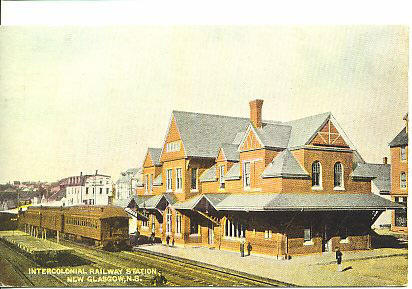 The third postcard shows the rear of the station in 1910. 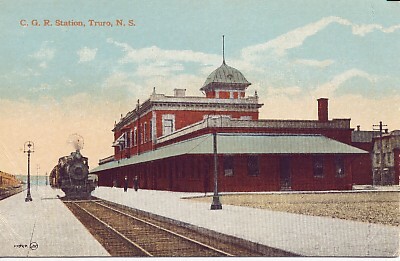 The final tinted postcard shows the station and water tower in 1894. 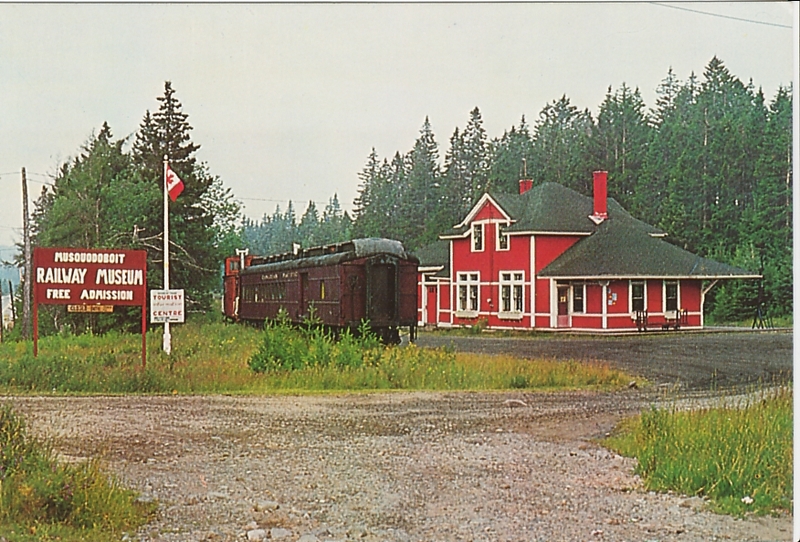 Although the card is titled Brown's Point the CN timetable calls the station Brown Point. Both are in the pre-Canadian National era. The photograph was published in the New Glasgow Evening News. 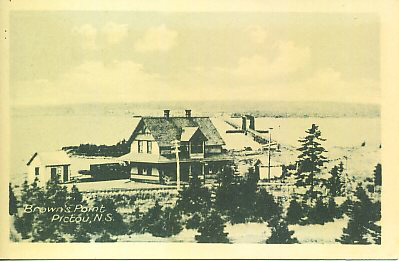 The clipping is from Don MacIsaac's collection courtesy of the Pictou-Antigonish Regional Library. Photo courtesy of Bob Bouchie. Thanks to Karen MacLeod of New Glasgow Library for sending the photo. 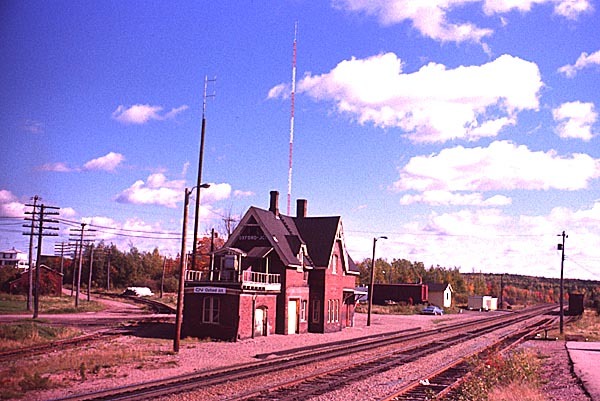 This station was replaced by a more utilitarian structure by CN. 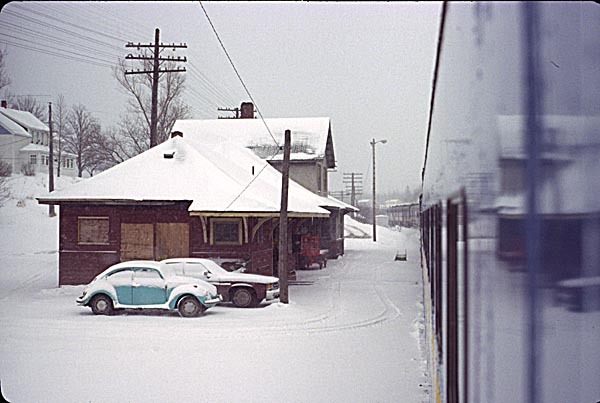 The new station is seen in two photographs taken by Gary Hadfield on 30 December 1972 (upper) and 2 February 1974 (lower). 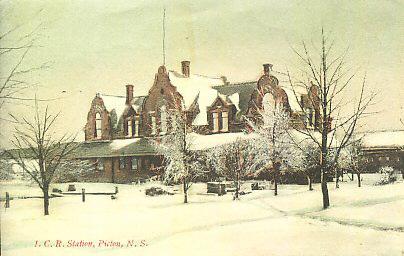 This building is now used as the offices of the Cape Breton & Central Nova Scotia Railway. - Gary Hadfield photos, � 2006. 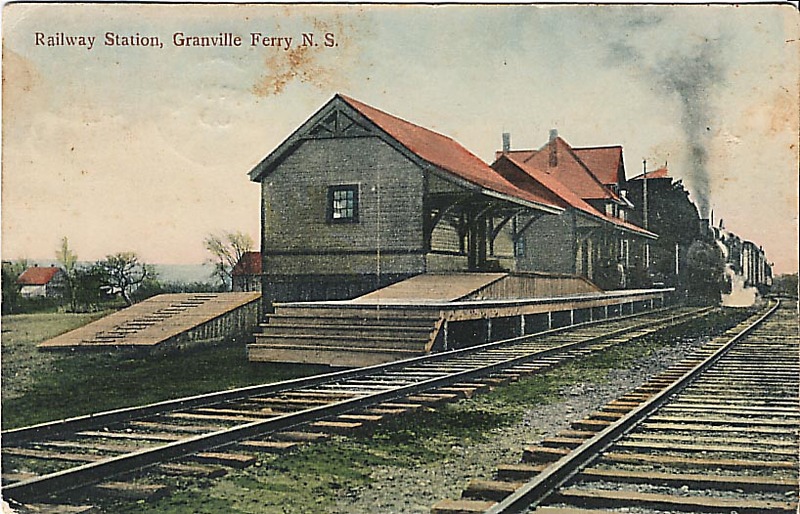 New Glasgow - Stellarton station. 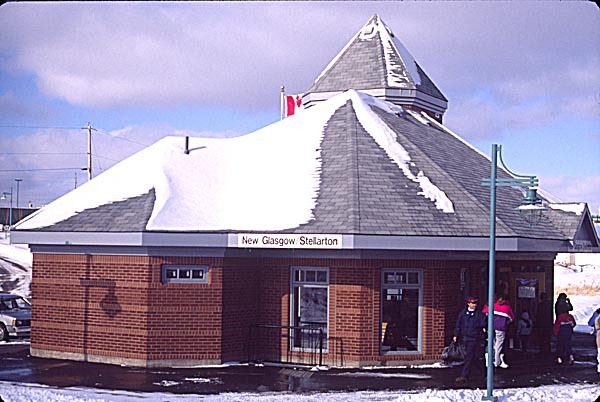 After the brick station at New Glasgow was demolished VIA built this new station close to the Trans Canada Highway to serve both New Glasgow and Stellarton. It is now part of the Museum of Industry (close window to return to this page). 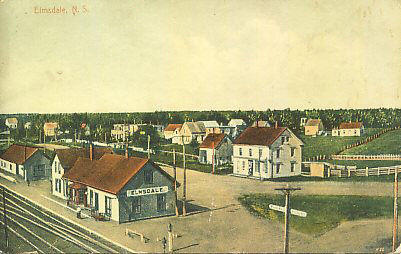 The upper postcard shows the station that was destroyed by fire in 1925. 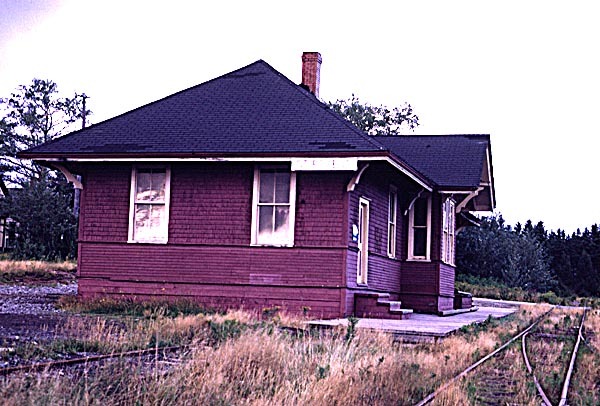 The lower is the second station that was still present in 1973. 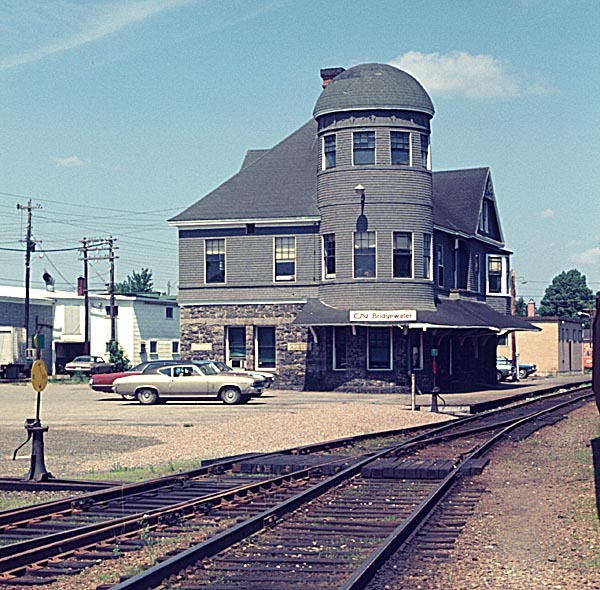 This beautiful brick station has now been demolished and the site is a grassy bank with a single track now owned by the CB&CNS. 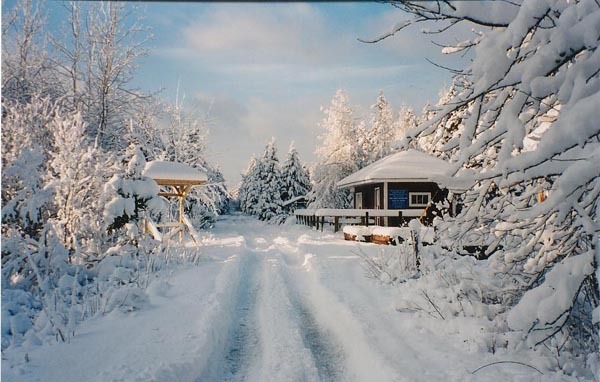 and in December 1988 (lower photo). - Bill Linley photo, copyright 2003. 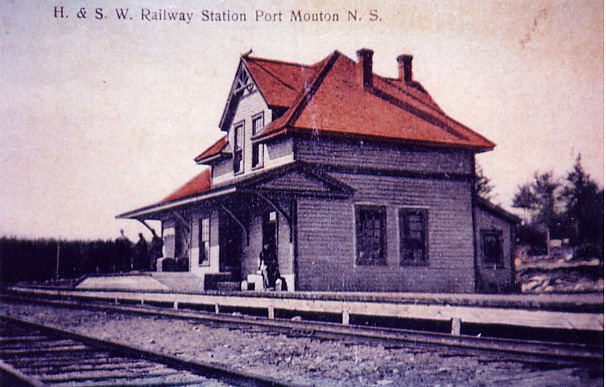 This station is still standing and is now a museum (close window to return to this page). The station was in need of a coat of paint, the signal arms had been removed but there was still a baggage trolley and a train board. The station now consists of a platform and signboard but despite the fact that passenger services will end in a week there are several passengers. 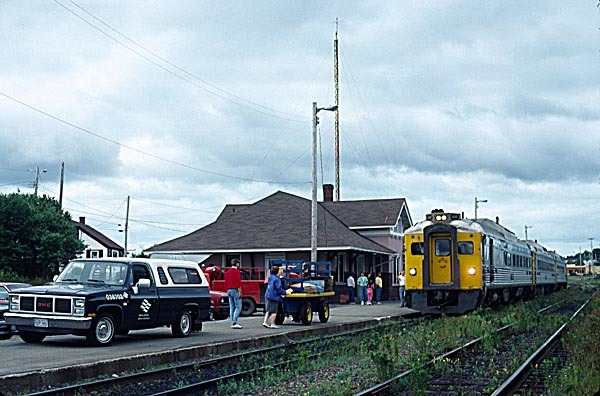 In October 2001 when the F40PH-2 failed on the eastbound Bras d'Or the platform was again used to unload and reload passengers. 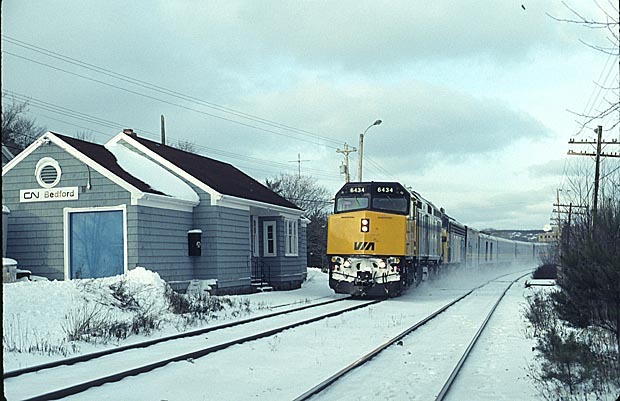 - as seen from a westbound RDC on 7 January 1990. A small VIA shelter is in use and the passengers can stand out of the wind. 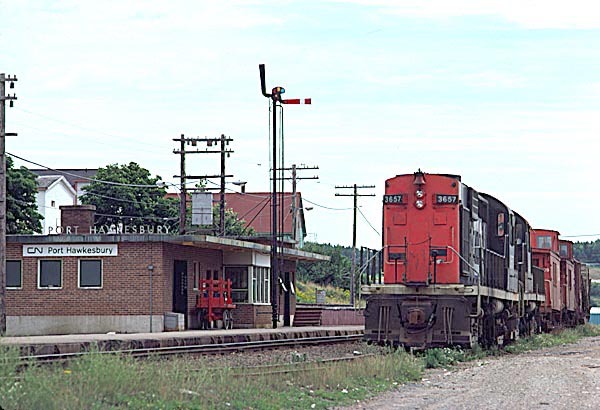 Until the Canso Causeway was built in the 1950s trains were carried by ferry to Cape Breton Island. 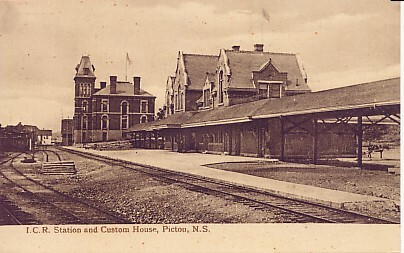 This station was unique in that trains in both directions reversed into the station because they could not be turned on the Cape Breton side of the Strait. 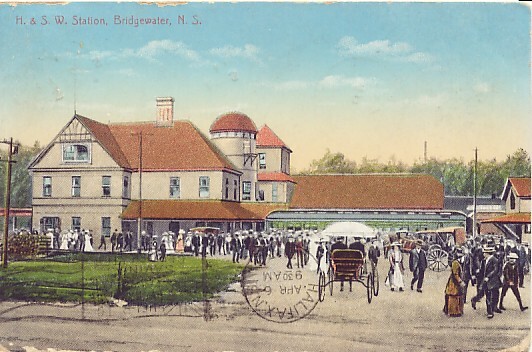 Another postcard can be seen on Byron Mackinnon's website and clicking on the CNR Station link (middle of left column). 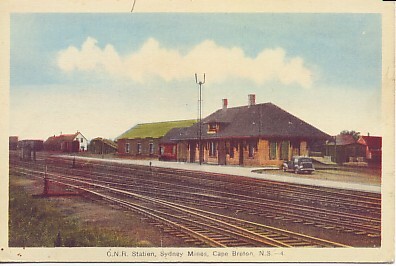 This station is now in use by the Cape Breton and Central Nova Scotia Railway The Bras d'Or used to change crews and stopped for up to one hour here. 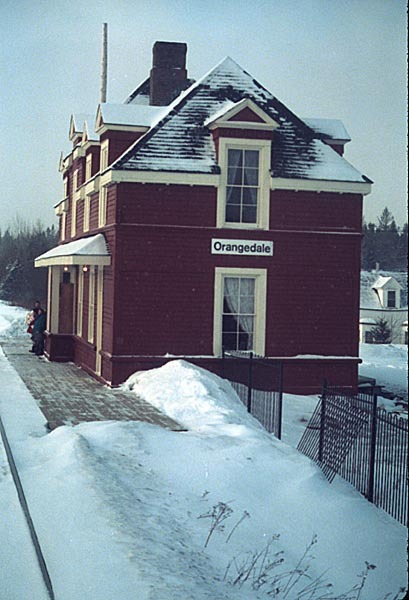 Orangedale station in the early 1970s and on 7 January 1990. 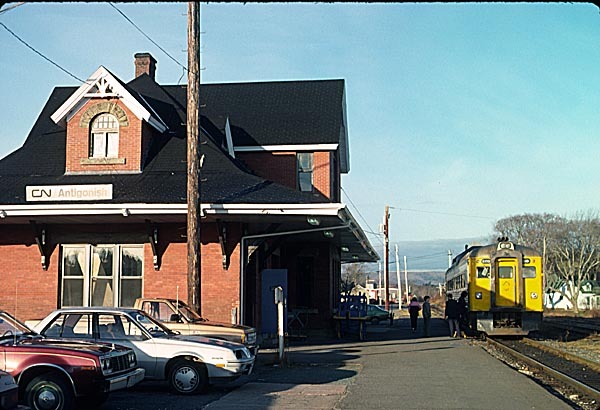 The station is now a museum and is one of the Main Museums of Railway Heritage in Nova Scotia. 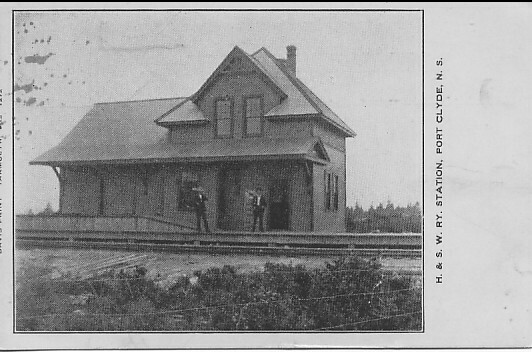 Three black & white photo of this station can be found on the Central Cape Breton Portal web site in Archive 1 - Click here to see the photo then close the page to return here. Thanks to Gerard MacNeil for permission to use the thumbnail and link. 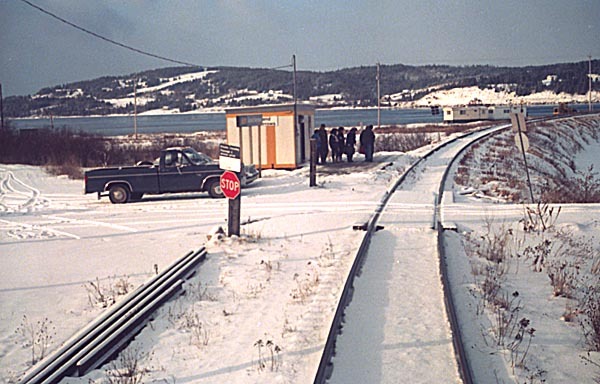 The small shelter can hardly accommodate the seven people waiting for the train at this windy spot on the Bras d'Or lakes. 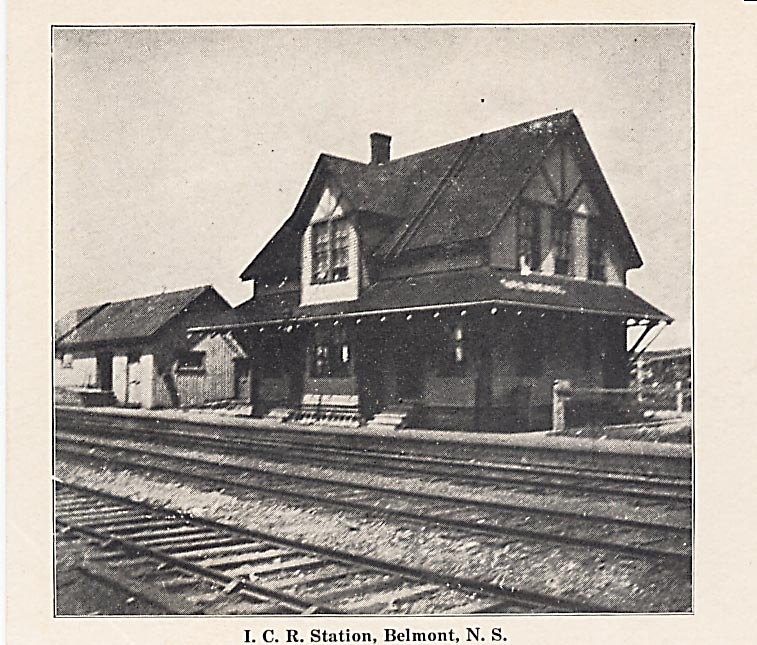 A photo of the earlier station can be found on the Central Cape Breton Portal web site in Archive 2 - Click here to see the photo then close the page to return here. Thanks to Gerard MacNeil for permission to use the thumbnail and link. 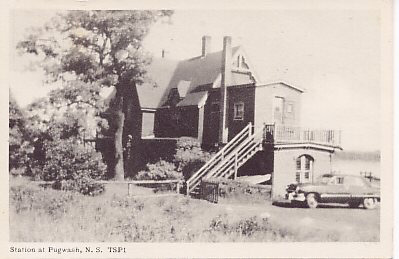 A black & white photo of this station can be found on the Central Cape Breton Portal web site in Archive 4 - Click here to see the photo then close the page to return here. Thanks to Gerard MacNeil for permission to use the thumbnail and link. 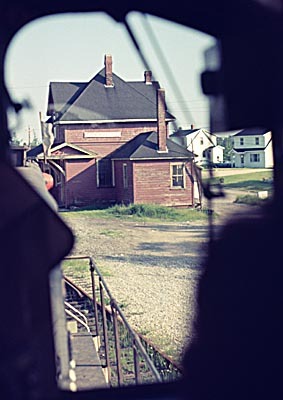 Sydney Mines station seen from train 605 on 7 January 1990. 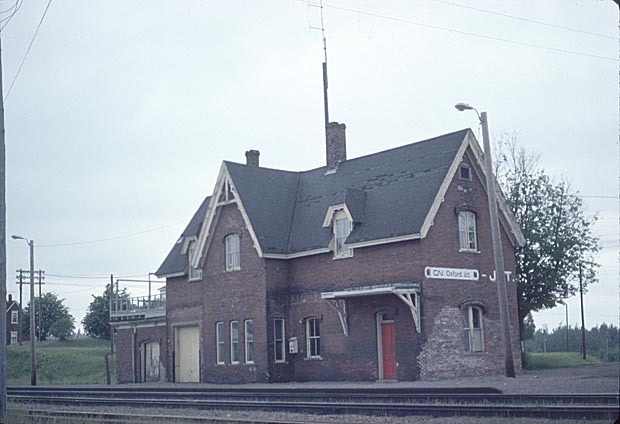 This station is still standing and has been converted into a railway museum with several pieces of DEVCO equipment displayed beside the station. and on 7 January 1990 at 8:58 am (lower photo). - David Othen photo � 2003. 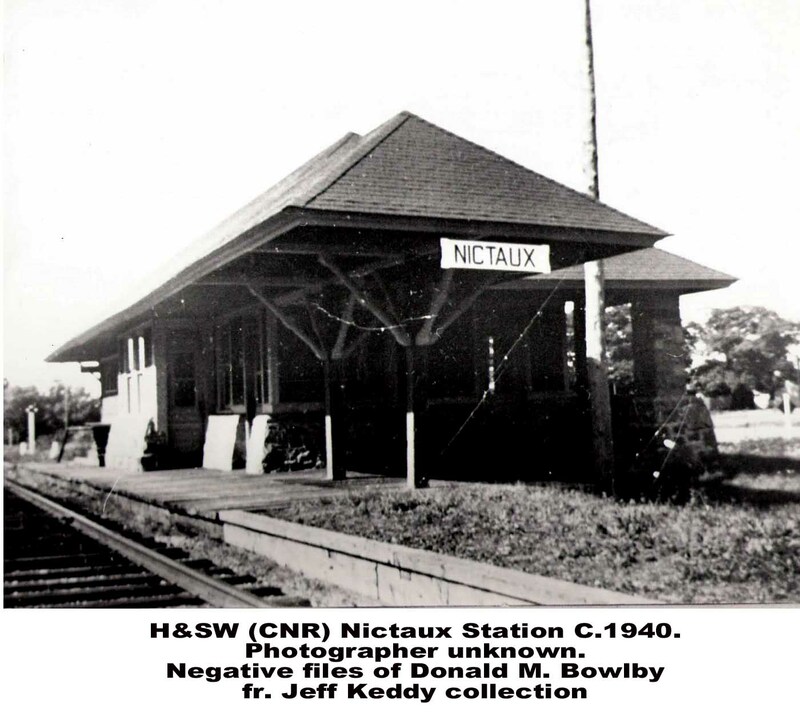 This station was an interchange point for passengers to Newfoundland who took the ferry to Port aux Basques. A Marine Atlantic truck can be seen in the upper photo. 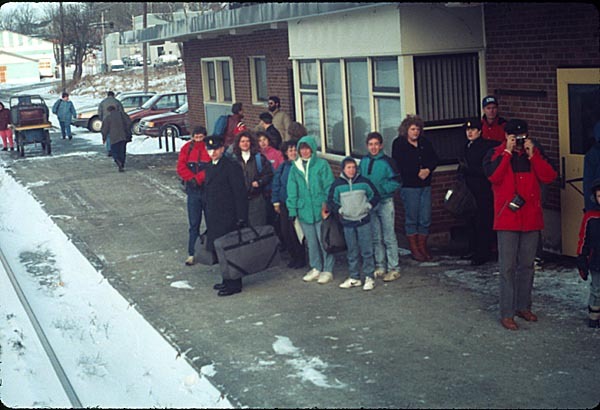 In the second photo a large number of students from Newfoundland are waiting for the train on their way back to University after the Christmas break. The passenger service ended the next week and so the students had to find another way home! - on 12 October 1975. 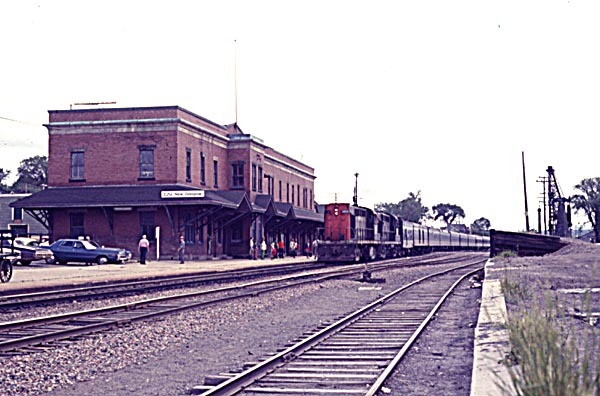 The brick station on the left is now a wharehouse and store. 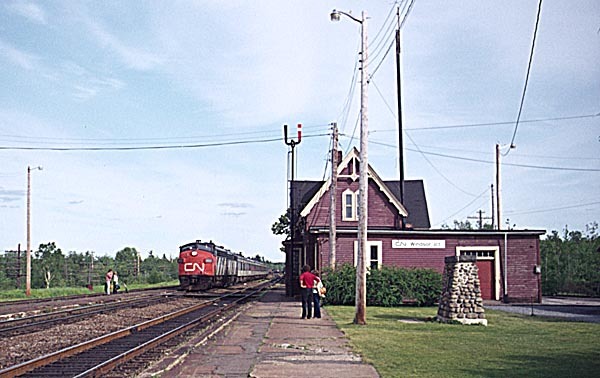 A CN Passenger train is waiting to depart while on the right a SYSCO locomotive is switching rail cars. - in the early 1970s. 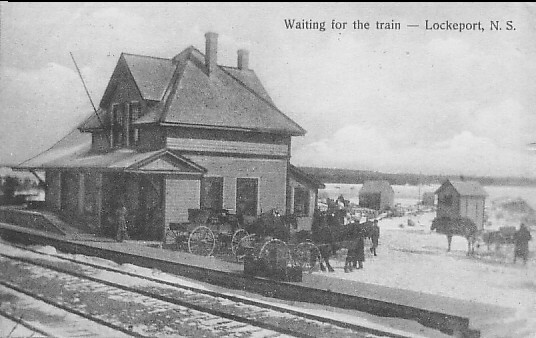 The station and a work train are seen in this photo. The line closed soon after this photo was taken. - on 5 September 1967. 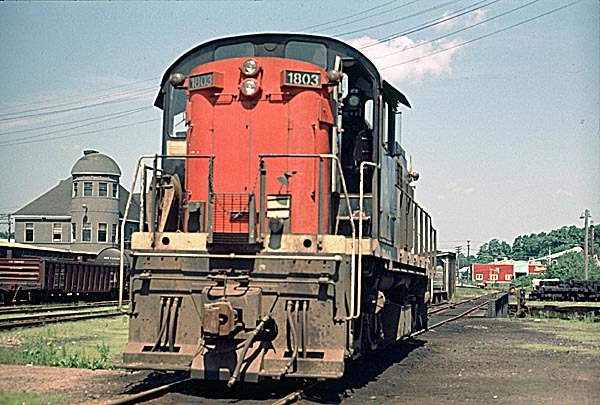 CN SW1200RS 1334 with the oil train for Imperoyal about 1973. 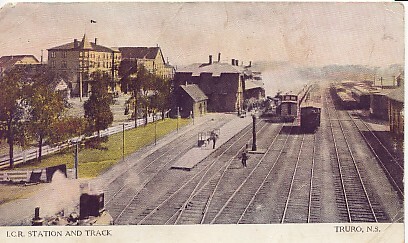 The Dartmouth station is in the background. 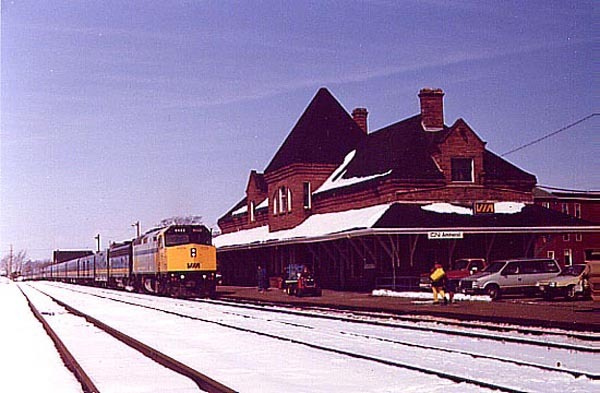 Soon after this photo was taken the station was demolished and the site is now an unpaved car park and a holding point for Metro Transit buses. Progress? Petain Station - West Chezzetcook. 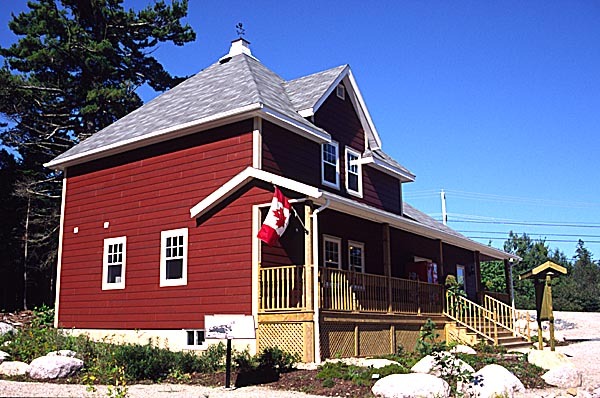 Replica station built as an Interpretative Centre as part of the Rails to Trails initiative by the Blueberry Run Trail Committee. As a result of the damage from Hurricane Juan and extensive vandalism the trail has been closed and has been taken over by the Department of Natural Resources. They are allowing loggers to use the trail to access areas that are being clear cut. 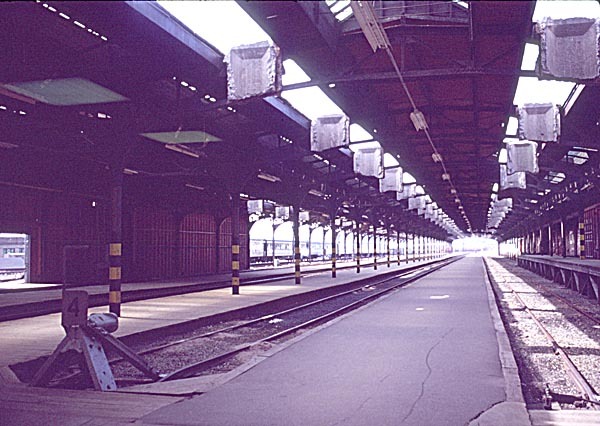 The photos show the station before the vandalism and hurricane. For more information contact Roger Belanger who kindly notified us about this project. 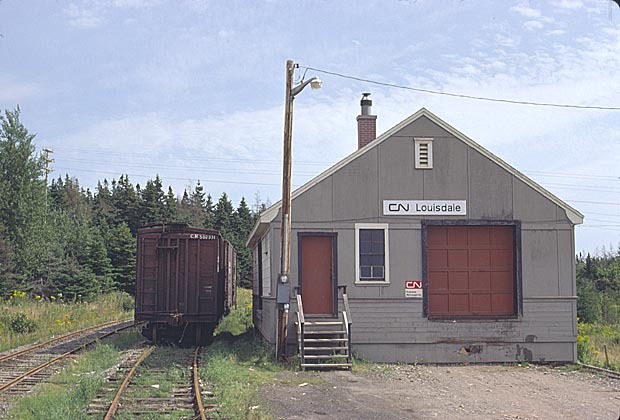 This line was originally the Halifax and Southwestern Railway and then became the Chester and Yarmouth Subdivisions of CN. 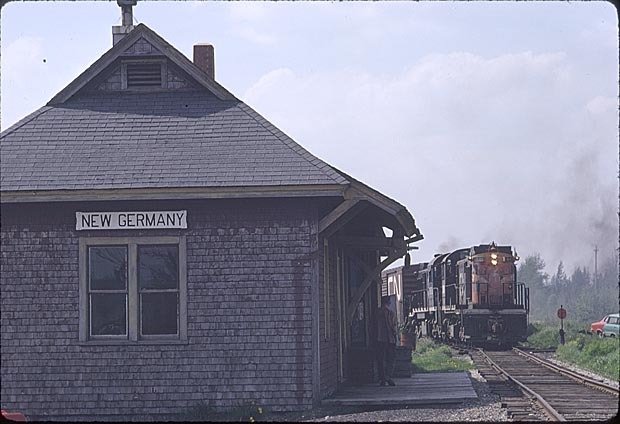 It ran from Southwestern Junction near Fairview to Yarmouth via Chester, Mahone Bay (connection to Lunenburg), Bridgewater (connection to Middleton subdivision to Bridgetown and Caledonia), Liverpool and Lockeport. 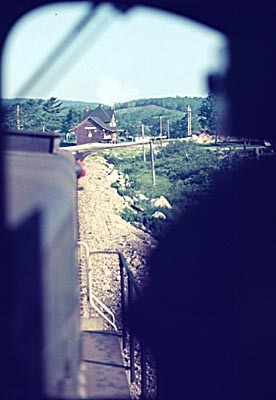 - seen from cab of a CN SW1200RS, 7 July 1973. 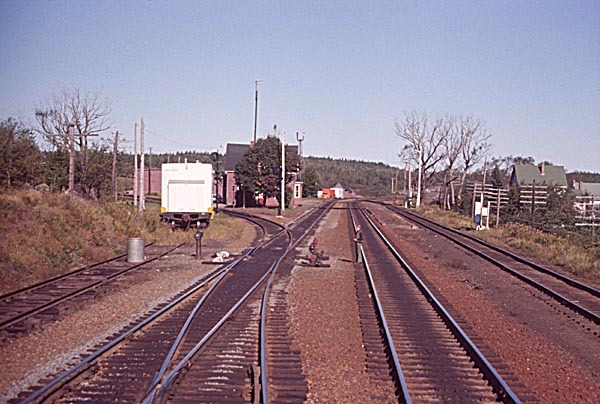 In the early 1970s CN ran a daily freight from Rockingham yards to Bridgewater with connection at Mahone Bay to Lunenburg. This was usually powered by three SW1200RS locomotives. 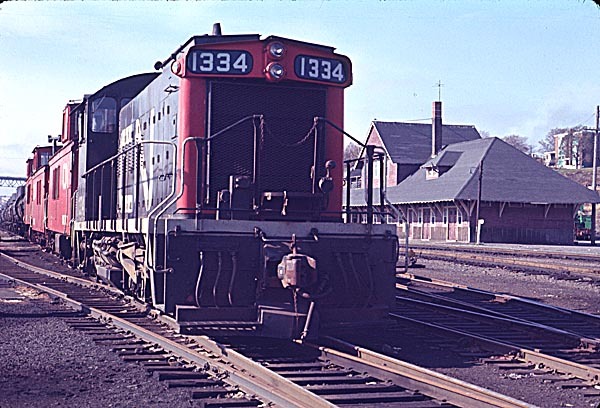 It backed out of Rockingham yard towards Halifax until it reached Southwestern Junction and then headed up the grade across Joseph Howe Avenue. 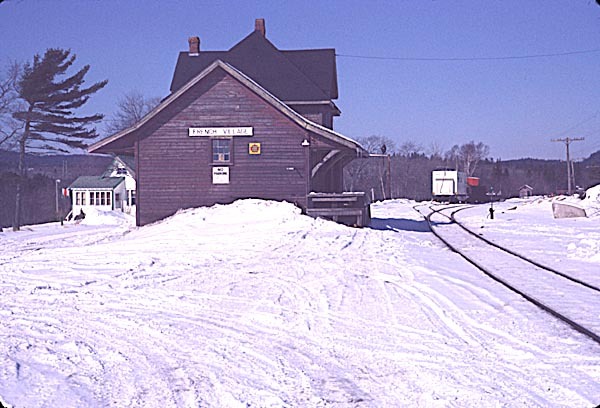 The upper photo was taken on the journey to Bridgewater and shows the view as we approach the east side of the station. 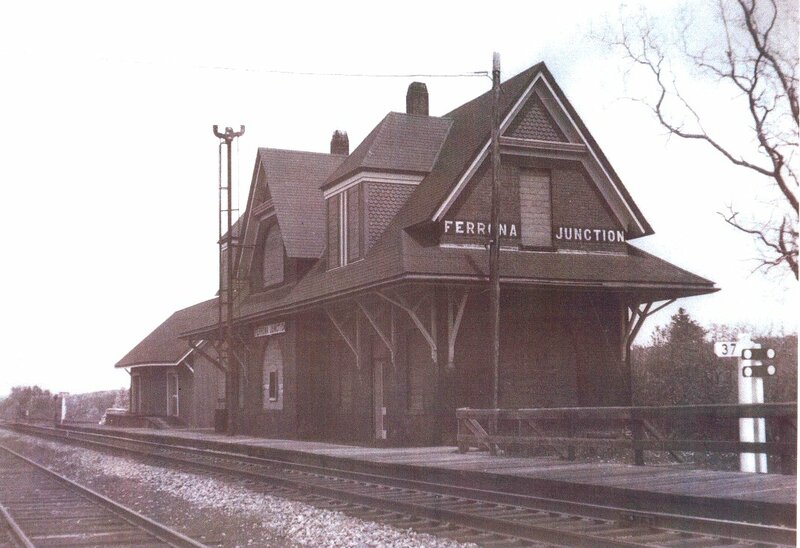 The middle photo was taken on the return journey and shows the west side of the station. 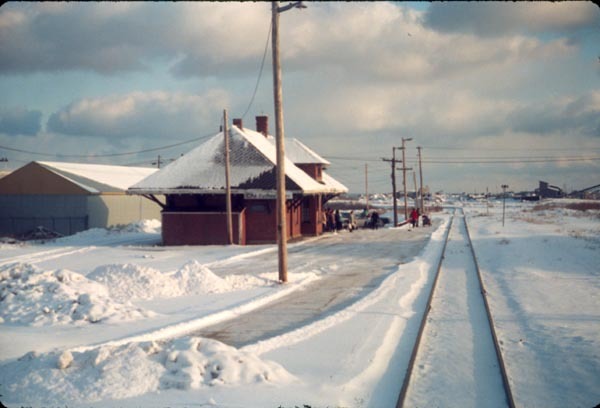 The bottom picture shows a picturesque scene of French Village station in the snow in the early 1970s with a work train on the siding. 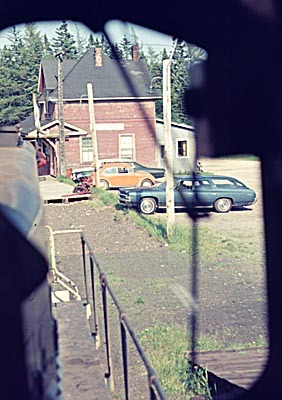 - seen from cab of a CN SW1200RS, 7 July 1973 (upper two photos). 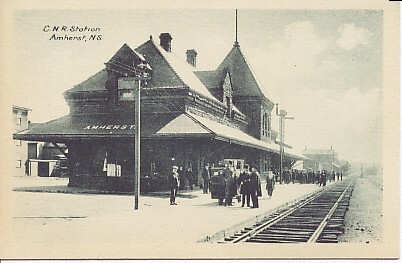 The lower photo was taken on the return journey and shows the west side of the station. 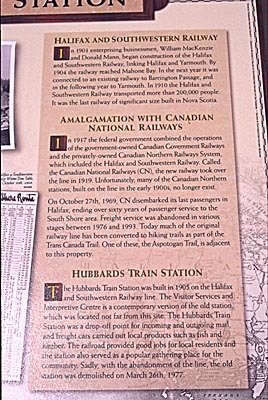 Replica Hubbards station and plaque 29 September 2002 (lower two pictures). - Bill Linley photos, � 2003. 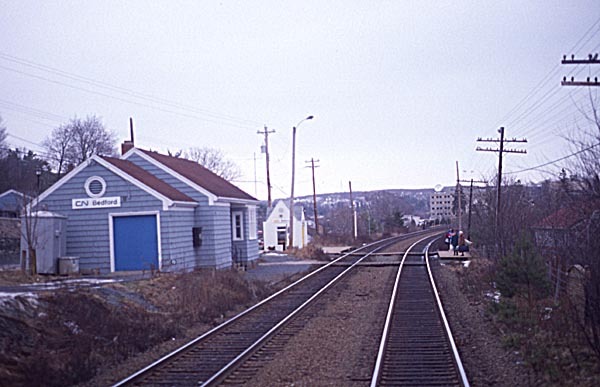 Hubbards lost its CN passenger train (Halifax to Yarmouth run) in October, 1969, and its train station in March, 1977. 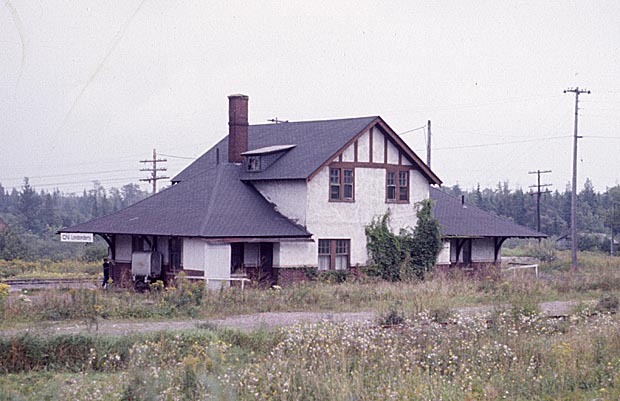 In 2002, a contemporary version of the old Hubbards Train Station was built, not far from the original site, to house a regional Visitor Services and Interpretive Centre. 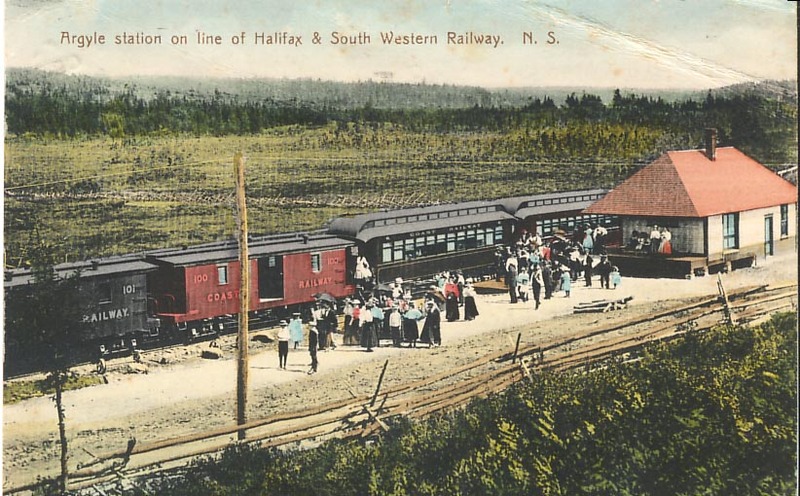 Outside is a plaque describing the history of the Halifax and Southwestern Railway. CN RSC-24 1803 stands near the turntable at Bridgewater on 7 July 1973 with the unusual round-towered station in the background. 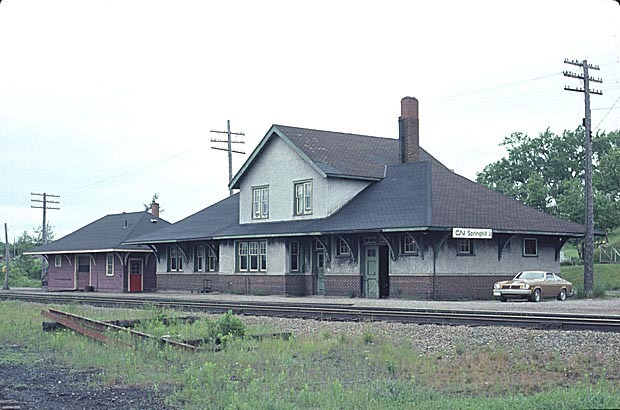 Subsequently, the station burnt down and now all the tracks and the unique RSC-24s which served the area on the Caledonia branch in the 1960s and early 1970s are gone. 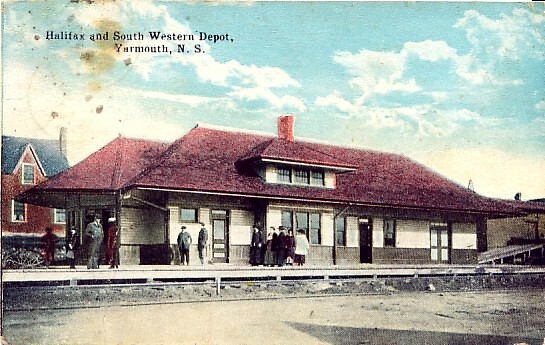 Both the Halifax & South Western and Dominion Atlantic Railways had stations in Yarmouth. Al Paterson photo, Bill Linley collection. This line crossed the province from the Atlantic Ocean to the Bay of Fundy. 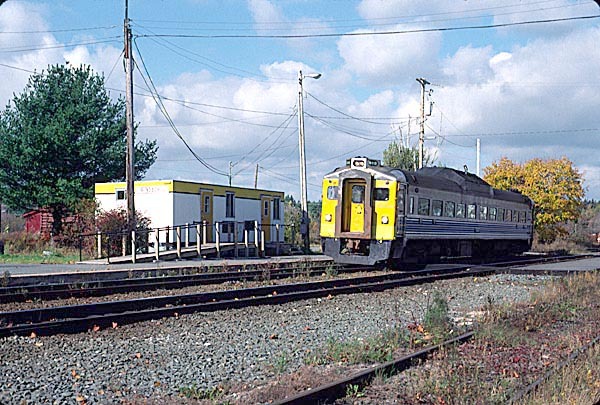 It was of light rail construction and in later years was home to the RSC-24 units in the 1800 series. 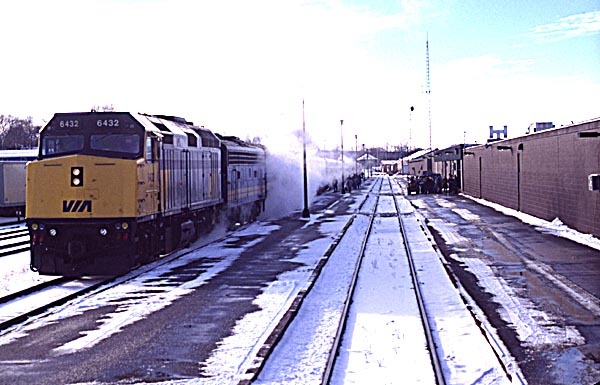 Two RSC-24s are seen switching the yard. The photo, by an unknown photographer, was part of the negative files of Donald H Bowlby and is now in Jeff Keddy's collection. 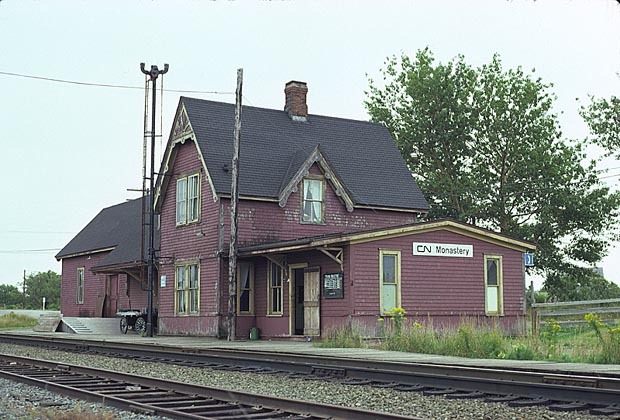 Copyright 2006-7, the Nova Scotia Railway Heritage Society, all rights reserved. Last updated 07 September 2007.